The Linux Audit framework is a kernel feature (paired with userspace tools) that can log system calls. For example, opening a file, killing a process or creating a network connection. These audit logs can be used to monitor systems for suspicious activity. In this post, we will configure rules to generate audit logs. First, we will use auditd to write logs to flat files. 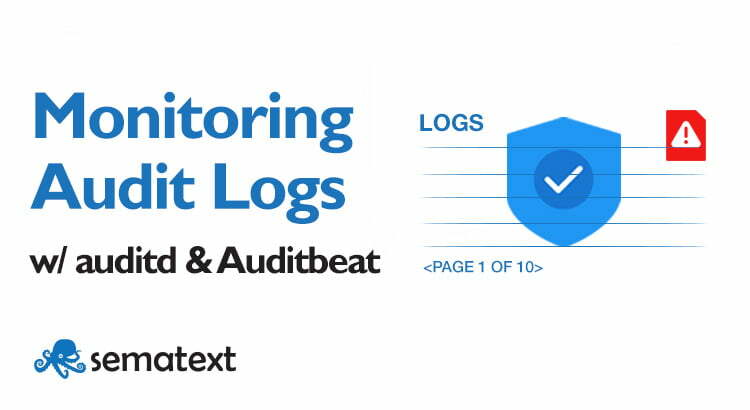 Then we’ll use Auditbeat to ship those logs through the Elasticsearch API: either to a local cluster or to Sematext Logs (aka Logsene, our logging SaaS). Along the way, we will search through the generated logs, create alerts and generate requests. Audit logs are used to track suspicious activity, but what does “suspicious” actually mean? As with all logging, the answer will depend on both what we need and how much it costs. For example, if you’re hosting websites, you may be interested in changes to document files. You may also be interested in accesses outside document root or privilege escalation. The list can always grow, but so will the cost. Intercepting more system calls will add more CPU overhead, and storing more events for the same period will cost more. To strike a good balance, you’d first figure out what is needed, then think about how to implement it in a cost-effective way. For this post, let’s say we want to track user management and changes to the system time. To implement this, we’ll track access to /etc/passwd and system calls to change time. The Linux Audit daemon (auditd) is the go-to application for tapping into the Linux Audit framework, which exists as its userspace component: auditd can subscribe to events from the kernel based on user-defined rules. auditctl defines and lists audit rules. It has a really nice man page that you can use as a reference, but we’ll call out the important bits here. -w /etc/passwd starts a watcher on a file. When the file is accessed, the watcher will generate events. -p wra specifies the permission type to watch for. “wra” adds up write, read and attribute change. -k passwd is an optional key. Later on, we could search for this (arbitrary) passwd string to identify events tagged with this key. Sure enough, our rule is there. type=SYSCALL msg=audit(1522927552.749:917): arch=c000003e syscall=2 success=yes exit=3 a0=7ffe2ce05793 a1=0 a2=1fffffffffff0000 a3=7ffe2ce043a0 items=1 ppid=2906 pid=4668 auid=1000 uid=0 gid=0 euid=0 suid=0 fsuid=0 egid=0 sgid=0 fsgid=0 tty=pts4 ses=1 comm="cat" exe="/bin/cat" key="passwd"
Speaking of auditd.conf, you may wonder what kind of knobs auditd itself offers. Most of them are about how auditd writes to its log file. Not only its path (log_file), but because audit logs are very sensitive, what auditd should do when the going gets tough. From rotating the logfile (how often? Specified via num_logs) to what to do when you run out of space: do nothing? generate a syslog message that could be sent over the network? shut down the system? There are more low-level options, too. Like how often should the log be fsync()ed to disk (freq and flush). Auditd can also write to an external program (dispatcher) in a blocking or unblocking fashion. Unfortunately, you can’t change the log format, this is coming from the Kernel. The log_format option only allows you to choose between logging to the dispatcher only (NOLOG) or to the dispatcher (if any) and the log file. The auditd.conf manual is very nice and descriptive about all the options. -k changetime is the same optional tag for identifying the rule. -S clock_settime specifies the system call. You can find the full list, along with the kernel version where each call was introduced, in the syscalls man page. Go to each system call to see its own man page. Back to our command, you can specify multiple -S parameters. This will watch for multiple system calls in one rule, lowering the audit overhead. -a exit,always specifies the list to log to and the action. The exit,always combination is the most widely used. The exit list will produce an event when the system call exits. Other lists are task (when a task/process is created), user (to filter userspace calls based on user attributes), and exclude (for filtering out events). The always action timestamps and writes the record. This contrasts to never, which is used to override other rules. Note that rules are evaluated in order, so exclusion rules should be on top. -F arch=b64 specifies a filter, defined by a key (arch), a value (b64) and an operator (=). This one filters only 64-bit architecture system calls. We need to specify it for the kernel to identify the clock_settime we want. You can filter by user id, use greater than (>) or less than (<) operators, and much more. You’ll find the whole list in auditctl’s man page. As with system calls (-S), you can specify multiple filter (-F) arguments to combine multiple filters. type=SYSCALL msg=audit(1522928030.508:2940): arch=c000003e syscall=227 success=yes exit=0 a0=0 a1=7ffe530e4db0 a2=1 a3=7ffe530e4b10 items=0 ppid=2906 pid=4745 auid=1000 uid=0 gid=0 euid=0 suid=0 fsuid=0 egid=0 sgid=0 fsgid=0 tty=pts4 ses=1 comm="date" exe="/bin/date" key="changetime"
In these events, we don’t see the name of the system call (clock_settime), only its number (syscall=227). To see the mapping between system call numbers and their names, run ausyscall –dump. On this particular system, one of the lines was 227 clock_settime. Now that we have some audit logs, let’s go ahead and analyze them. We can always use the likes of grep, but the Linux Audit System comes with a few handy binaries that already parse audit logs. For example, ausearch can easily filter logs by the event key we defined with -k in our rules. Below you can see traces of when the changetime rule was added and when it was triggered by the date command. Using the standard tools of the Linux Audit System is usually enough for monitoring a single system. Larger deployments will benefit from centralizing audit logs (as they do for all logs). By shipping audit logs to Elasticsearch, or to Sematext Logs, our logging SaaS exposing the Elasticsearch API, we are able to get a better overview of all hosts. Searches and aggregations will also scale better with the volume of audit logs. Auditbeat is the tool of choice for shipping Linux Audit System logs to Elasticsearch. It replaces auditd as the recipient of events – though we’ll use the same rules – and push data to Elasticsearch/Sematext Logs instead of a local file. Rules previously set with auditctl now go under the audit_rules key of Auditbeat’s auditd module. Like with Filebeat, to send data to Sematext Logs instead of a local Elasticsearch, you’d use logsene-receiver.sematext.com as the endpoint and your Sematext Logs App token as the index name. the Linux Audit System has rich audit capabilities, letting you track all system calls right from the kernel. auditd can listen to and log all audit events based on a set of rules defined via auditctl. You can use ausearch and aureport to drill through the local audit log. Auditbeat can replace auditd and listen to the same events, following rules defined in the same auditctl format. It will convert these events into JSON and push them to Elasticsearch/Sematext. There, you can run searches, create alerts and reports based on data from multiple hosts. Auditbeat itself has a file integrity module. You can use it to set up file watchers, much like we did here with the auditd module. Being a higher-level feature, it’s often less efficient. For example, it has to scan for new files on startup. The upside is that it will work on Windows and OSX as well, not only on Linux. Bro is a framework geared towards network analysis, aiming to bridge the gap between academia and operations. Read more about Bro and how to ship Bro Logs to Elasticsearch/Sematext. Falco is, roughly said, the userspace equivalent of auditd. It can give you richer information, but it’s going to be easier to disable. Of course there’s much more to it than that, so if you’re curious, read more on Falco and how it compares to auditd, but also enforcing frameworks, such as SELinux and AppArmor. Wazuh and Moloch are also IDS frameworks, focused on file integrity and network monitoring respectively. Both are integrated with Elasticsearch, so you can ship this information to Sematext as well, using the same API. can we use auditbeat on window server ? I am working on a sql audit software , can we use auditbeat as a sql auditing tool ?